Stately and well-maintained 4BR, 3 1/2 bath home in the highly desirable Thornbury Hunt, known for warm and family friendly community. Ride bicycle with your kids, walk your dogs or even take a long leisurely walk along the well-maintained walking path graced with beautiful mature trees throughout the whole development. Did I mention walking distance to Thornbury Park? Where you can spend the whole afternoon in the playground, or play baseball and basketball with your kids.This gracious home has been recently painted and offers many upgrades such as less than two-year old roof, brand new water heater and top-of-the-line HVAC. Never miss a show on TV in the open concept gourmet kitchen with gorgeous cherry wood cabinets w/granite countertops and center island bar w/Jennair cooktop open to the breakfast area and family room where your family can hang out and relax while you whip up a delicious meal and be the master chef that you~ve always wanted to be. The welcoming two-story foyer leads one to the office/library, formal LR and a huge formal DR featuring a large picture window with lots of natural light, chandelier, crown molding and chair rail. Enjoy breakfast flanked by sunlight through the French doors with view of your very private backyard. Catch up on movies or read a book on a rainy day at the extra-large bay window with seating next to fireplace in the cathedral ceiling FR. Updated Powder Room is just off the Kitchen. A convenient laundry room w/utility sink completes the first floor. The beautifully finished basement (700 sqft) with high ceiling, large full bath and about 350 sqft of shelved storage area where you can organize all of your favorite things; the LL offers an additional inviting retreat and entertaining space. The sumptuous MBRM suite offers a true retreat with corner jacuzzi tub where you can soak and stare at the stars on a calm evening through the large skylight window, plenty of storage in the large walk-in closet with lots of shelves. All BRs are generously sized with large windows. Extra attic insulation; attic roof fan and much more!The oversized 2 car garage boasts a tiled floor! Highly ranked West Chester School District. Conveniently located next to Thornbury park, nearby shopping, restaurants, museums, schools, colleges. Easy and quick access to I95, Rts 202, 322, 1, KofP, Wilm, West Chester and more! 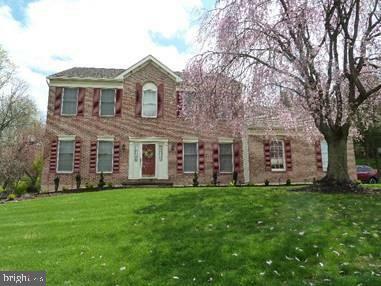 All in the beautiful Glen Mills countryside! This is the one for you!